People in southern India and Pakistan are struggling to cope with the effects of days of heavy rain that have left several hundred people dead. Thousands of people have been evacuated from low-lying areas amid warnings that a cyclone threatens more chaos. Much of Pakistan's biggest city, Karachi - where 200 people died - is still without power and water. More than 140 have been killed in the rains in India. There have also been a number of deaths in Afghanistan. Officials have been evacuating residents from shanty towns in Karachi, where badly built homes collapsed or were washed away by the torrential rain. A provincial official said the army had been asked to help evacuate people from coastal areas. 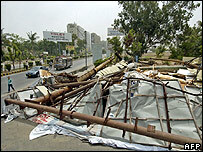 Correspondents say the over-burdened infrastructure of Karachi just could not cope with the deluge. 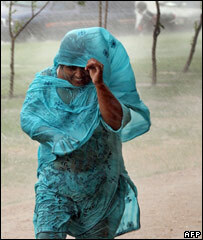 Forecasters had said cyclone Yemyin would hit most of Pakistan's Arabian Sea coast and much of India's west coast. But on Tuesday, officials said the worst might be over for Karachi as the tropical storm appeared to be moving north-west away from the city and was expected to make landfall in Balochistan province. Officials in Karachi say that in just one area of the city, Gadap in the north-west, more than 1,000 homes have been destroyed. Temporary relief camps have been set-up, but most of those affected are refusing to leave their destroyed homes. Gadap, like other areas of the city, is without drinking water. For weeks before the weekend floods, Karachi had been hit by hot weather and power cuts, leading to protests and rioting. Correspondents who have visited the flooded areas and the city mortuaries confirm that more than 200 people were killed, although the mayor of Karachi has said fewer than 70 deaths were confirmed. Meanwhile, the provincial governor has ordered that large billboards in the city should be taken down and in future there should be a limit on the size and number of billboards. Falling billboards and hoardings accounted for many of the fatalities in the city. Winds of up to 40 nautical miles an hour are predicted for the coastline of Pakistan. Fishermen have been told to stay on land because of the dangers of three-metre high waves. Indian weather forecasters have warned of a cyclone hitting the coastal areas of Maharashtra and Gujarat states by Wednesday. Heavy rains have already caused the deaths of some 140 people in southern and western India. The states of Andhra Pradesh and Karnataka have been the worst hit. The BBC's Sunil Raman in Delhi says the flood situation remains grim in parts of Andhra Pradesh, Karnataka, Kerala and Maharashtra. Tamil Nadu and Orissa have been put on alert. So far, some 25 people have been killed in Karnataka, 53 in Kerala, more than 38 in Andhra Pradesh and about 50 in Maharashtra. In Bagalkot, Bijapur and Raichur, the worst affected districts of Karnataka, more than 4,000 people have been left homeless after their villages were submerged in flash floods. Eleven relief camps have been opened for the homeless. Relief operations are also under way in Andhra Pradesh's Kurnool district which was badly affected by the weekend rains. In Afghanistan officials say floods and landslides have caused deaths in the provinces of Kunar and Kunduz and damaged housing in other provinces. Are you affected by the floods in South Asia? Send us your experiences using the form below.